German drug and chemicals company Bayer AG announced May 23 that it has made a $62 billion offer to buy U.S.-based crops and seeds company Monsanto. The proposed buyout would create a giant seed and farm chemical company with a strong presence in the United States, Europe, and Asia. Bayer said last Thursday that its executives met recently with their Monsanto counterparts “to privately discuss a negotiated acquisition” of Monsanto—the specialist in genetically modified crop seeds, which is headquartered in St. Louis, Miss. Monsanto said then that it was reviewing Bayer’s proposal. Bayer said it plans to borrow some $47 billion to finance the acquisition and produce the rest through equity, primarily by issuing new shares. Monsanto shares suffered a colossal tumble last year that evaporated about quarter of the company’s value. It has been struggling to recover ever since. Monsanto’s last year was rather unimpressive on paper—net sales were down 5 percent, while its net income dropped 16 percent. Yet, as more news emerged about Bayer’s acquisition appetite, Monsanto’s investors reacted positively, sending shares up by more than 20 percent over the past two weeks. Bayer, on the other hand, has been paying dearly for the prospective deal. Its shares have lost some 14 percent since May 11. Moreover, the company offered $122 per share, a 37 percent premium to Monsanto’s valuation before the deal was offered on May 9. Bayer expects the transaction will boost annual earnings by $1.5 billion after three years, thanks to synergies of the two companies. It hopes for more benefits beyond that. The takeover may allow the companies to better tackle the competition after two major consolidations in the sector in recent months. Last year DuPont and Dow Chemical announced a merger that would create a $130 billion giant, if approved by regulators. Earlier this year, China’s ChemChina bought Swiss Syngenta for $43 billion. 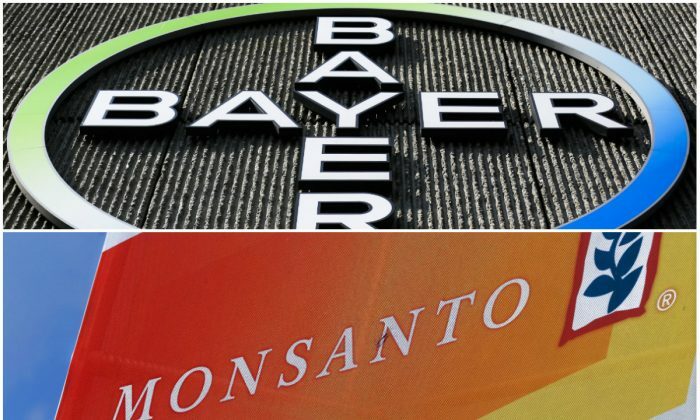 Monsanto sought deals with Bayer and BASF, another major player in the industry, in March, Bloomberg reported. Monsanto was interested in the crop-science businesses of the other companies. Bayer, based in Leverkusen, Germany, has more than 150 years history. It is perhaps best know for introducing aspirin to market and trademarking its name—although its U.S. trademark was confiscated by the government during World War I. It is perhaps less known that Bayer also introduced heroin to market and trademarked the name as a cough medicine. With the help of a series of acquisitions, it became one of the major pharmaceutical companies in the world. It also produces a line of pesticides, which, it says, will fit with Monsanto’s offerings. Monsanto, based in St. Louis, is one of the world’s largest agrochemical and biotechnology company. It has been a frontrunner in the genetic modification of plants, as well as the main target for the anti-GMO movement. Its best known product—Roundup, a glyphosate-based pesticide—is the most commonly used pesticide in the United States.